Mirror photo by Patrick Waksmunski Penn State offensive linemen Ryan Bates (left) and Will Fries go through blocking drills. Blame the offensive line! Nobody really knows what those guys do anyway, so it’s got to be their fault when something goes wrong! Isn’t that sort of how things go in football? No matter which team you root for at any level, from Penn State to the Steelers or anyone else, chances are you’ve spent a lot of time discussing with your friends about how the team’s O-line has a lot of problems. Even if, truth be told, you don’t really understand exactly what it is you’re talking about. Because let’s be frank, how many people have any clue what offensive linemen do or think about or have to deal with in the trenches? I’m not one of those “If you didn’t play the sport, then you can’t possibly understand it” kind of people. You can always learn a great deal about any sport if you watch and study it enough. But I will make the case that being an offensive lineman is different. It’s such a unique and challenging position in sports, and one that an incredibly small percentage of people who love the game have played, plus every guy on the line is dependent on everyone else. It’s remarkably difficult, therefore, for just about any casual football fan to critique linemen, save for the rare play when one guy clearly whiffs on an assignment. Then Limegrover went into great detail about the challenges associated with an offensive line. “Part of what comes into it is, as an O-line coach, I learned very early and was told by a very wise man, I never have a good day,” Limegrover said. “There’s never a time where all five of those guys do the exact right thing the way you line it out in the playbook, the way you put it up on the PowerPoint and the way you rep it. “It’s very hard because of all the moving pieces and everything that’s going on. So what happens is, when it breaks down with those guys, that’s when things break down (for the offense). Like, no one really pays a lot of attention if a receiver runs the wrong route, or if a back hits the wrong hole. Limegrover followed with a good story about the inner workings of some teams when it comes to coaching offensive linemen. “Even coaches, a lot of coaches will say to me, ‘Hey, you go do your thing. We don’t get it, we don’t understand it, it’s your deal. Just make sure we’ve got blue shirts on white shirts,'” Limegrover said. It’s no secret that Penn State has had major issues on the offensive line for several years. Some of them have been blatantly obvious, such as Temple sacking Christian Hackenberg 10 times in one game, or Saquon Barkley getting buried in the backfield far too often last season. Then again, even all of those plays might not have been entirely the fault of the linemen. Whether it was Hackenberg holding onto the ball too long on some of the sacks and also having poor footwork in the pocket, or the defense loading up the box so that there were just too many defenders for the O-linemen to account for, nothing is ever as cut and dried as it seems. 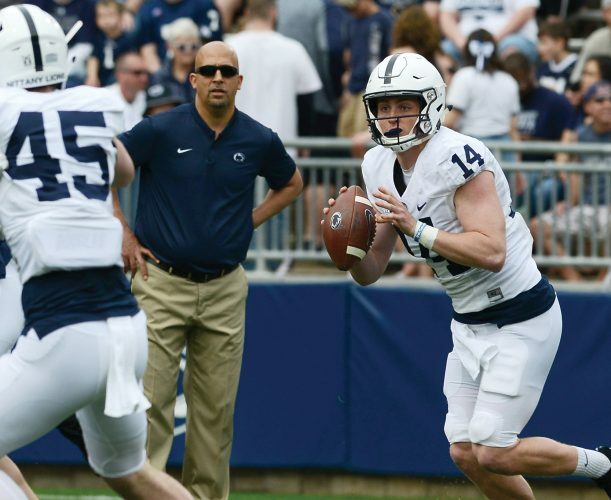 The first question offensive coordinator Ricky Rahne fielded during media day Saturday was on how the Nittany Lions’ O-line has been a point of contention. “The first thing I would say is, we’ve had pretty good offenses over the last two years,” Rahne said. “There were five guys out there who were blocking, so I think that the perception of our offensive line is probably not accurate. Limegrover would know better than anyone if indeed the Lions played better on the O-line than they’ve been given credit for in recent years. To their credit, Penn State’s offensive linemen have taken a lot of criticism in recent years and still have remained professional and respectful when answering pointed questions about their play. No one could fault them if, from time to time, they resort to thinking that outsiders are just looking for someone to blame and that the line is an easy target. “I think that happens,” Limegrover said before later adding, “I’d love to say, yeah, people don’t know what they’re talking about. But there are times where stuff just isn’t right. The best news of all for Penn State fans is that the offensive line is expected to be a strength, not a weakness, this season. We’ve heard that the past couple of years, as well, and it didn’t materialize, but things should be different this fall. 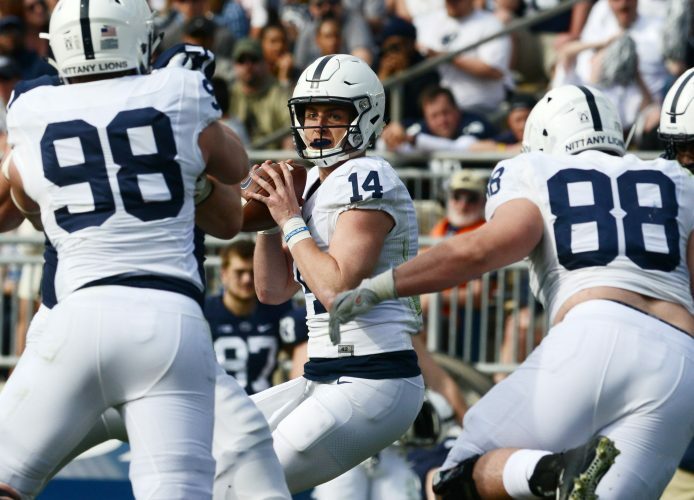 If indeed the O-line is much improved, it will take a lot of pressure off an offense that has some big holes to fill after losing Barkley, Gesicki and receiver DaeSean Hamilton. “We look at it and say, we’ve got good guys stepping in there, let’s take a little heat off of (running back) Miles Sanders,” Limegrover said. “Let’s be that much better this year because everybody’s a year older. We’ve got guys who have played a lot of football now. Let’s make Trace’s life easier.”?Cory Giger is the host of “Sports Central” weekdays from 4 to 6 p.m. on ESPN Radio 1430 WVAM.